A master’s degree in Geography is one stage in a process of lifelong learning. As a stage beyond the baccalaureate degree, the master’s degree allows students to explore and specialize in the domain of geography. The mode of instruction (e.g., seminars and independent studies), the process of learning (e.g., the exercise of critical and independent judgment), and the responsibility for learning (e.g., self-motivated exercise of responsibility with the guidance of an advisor) reflect a qualitative change from the undergraduate experience. There are multiple outcomes of the master’s degree including, but not restricted to, continued graduate studies leading to a doctoral degree; or professional service or employment with the possibility of continued graduate studies at some later date. 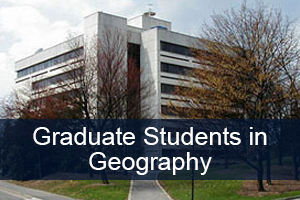 The key characteristics of the Penn State master’s degree in Geography are proficiency in the knowledge base of geography and a capacity to undertake independent, scholarly research. The master’s degree in Geography is a two-year program that culminates in a thesis. In some cases, master’s candidates opt to write two scholarly research papers. Progress through the degree is under the guidance of an adviser and two other faculty committee members. Throughout the program, students are expected to participate in multiple activities that will broaden and deepen their understanding of geography. Through Graduate Teaching Assistantships, students will be exposed to the fundamentals of teaching and the coordination of group and individual learning. Through Graduate Research Assistantships, they will be exposed to all facets of the professional research process. Our online Graduate Student Handbook explains the program requirements for all degrees.